A man was on his morning jog when he stumbled across a 7ft (2.13m) boa constrictor in a brown pillow case. He was running in St Neots, Cambridgeshire, when he spotted the non-poisonous snake in bushes and took it home before the RSPCA collected it. Inspector Stephen Reeves said that it was healthy and suspected the owner "just no longer wanted him". The charity wants to rehome the snake, which has been taken to South Essex Wildlife Hospital. Mr Reeves added: "We believe people are unaware of how much of a commitment these animals are, and once they grow in size they can no longer cope." 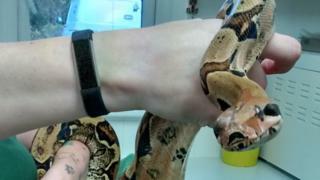 The RSPCA has urged the owner of the snake, which was found on Wednesday, 29 November, to come forward.